Having problems with your Jeep transfer case, don't buy used transfer cases? You already have a used transfer case no body need two, either rebuild or replace your transfer case. We offer a wide selection of high quality remanufactured transfer cases for Jeep vehicles including the following models: Cherokee, CJ5, CJ7, Comanche, Grand Cherokee, Grand Wagoneer, J10, J20, Scrambler, Wagoneer and Wrangler models. Removing and replacing a transfer case with our remanufactured unit is much easier then overhauling the transfer case. We can provide a direct drop in replacement, removing all risk of getting the incorrect unit. Our transfer cases have a 12 month unlimited mileage warranty. Call 800-216-1632 and talk to an expert, we can save you money! We can provide direct drop in replacement transfer cases for the following models: NP231J, NP242J, NP229J, NP208J, NP228J, DANA300, NP229, NV245J, NP247J, NP242JHD, NP249, NP249J and NP228J. Our remanufactured Transfer Case Units unlike many lower quality rebuild transfer cases, are factory remanufactured. The transfer case units we offer have been thoroughly tested from the smallest piece to the completed assembly. Purchase any DTS-UMT model transfer case and be assured your transfer case will have the latest compliance upgrades installed! Not offered by most builders. Our rebuilt transfer cases get new seals, bearings, chains, fork pad, encoder motors and viscous couplers. All shafts, slider, hubs and planets are inspect to ensure proper tolerances are maintained. All units are tested at the factory prior to shipment. Low service expectancy parts are automatically replaced regardless of their condition. All other parts that do not have absolutely new potential service life are replaced with only the highest quality parts available. Improvements (upgrades) are performed to improve on the manufacturer's design when possible. But these procedures alone will not guarantee you the highest quality transfer case. It is the experience of the crafts people with their knowledge, dedication and uncompromising desire to improve that makes our remanufactured transfer cases the standard of quality in the industry. Our Jeep transfer cases come with all new bearings, gaskets, seals and viscous couplers replaced, a large number of planetaries are also replaced. Detailed inspection procedures and each unit is factory pressure tested and comes with a no hassle warranty. 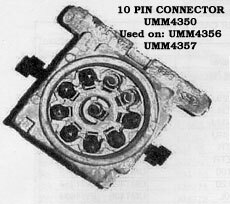 With you assembly number we remove all risk from getting a unit that was not designed for your vehicle. Wondering what the difference is between rebuilt unit and re manufactured unit? The person offering the rebuild service gives you a price typically without opening up your transfer case. He is guessing and betting that he can fix the unit with minimum expense for parts and get you on your way without a warranty! Our re manufactured units have more new parts and come with a 12 month warranty. Another thing to consider is that it takes less mechanical skills to remove and replace a complete unit than it does to rebuild a unit if you are considering doing the job yourself also less time. If you have good mechanical skill and time rebuilding your existing unit is recommended. Use the figure at the right to assist you in correctly identify what transfer case you have, it's located on the rear of the unit. The assembly number is the key to getting a direct drop in replacement. Information is also provide to assist you in identify which Yoke and Switch types that your transfer case has. So the next time you need a transfer case remember - all transfer cases are not the same - you can never make a bad decision by choosing drivetrain.com the best. Great Value! 12 month, unlimited miles warranty! Wondering what is a core? 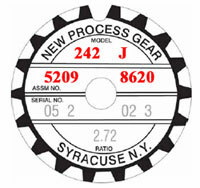 Please provide the assembly number of the tag on the rear of your New Process transfer case, this will ensure that you receive a direct drop in replacement. What transfer case do you have? Just consult our detailed application guide below! Replacement parts to assist you with the repair of your Transfer Cases for Chevrolet, Dodge, Ford, Jeep and many more! Find your transfer case parts. Transfer Case, Remanufactured Transfer Cases, Save Money, select your vehicle model from the following list will take you to the units available for your application. Cherokee J10 Wrangler Transfer Case Parts, Overhaul it yourself and save MONEY! Please provide assembly number off the rear of your transfer case at time of order, this will ensure direct drop in replacement! Upgrade heavy duty NP231D this modified transfer case includes a heavy duty chain, two HD chain sprockets and syncro/slider. Your cost price of the unit plus $145.00. 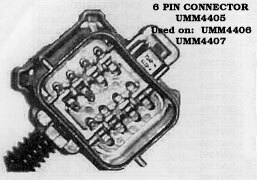 Upgrade 249J to NP242 to eliminate the viscous coupler problem with the NP249. 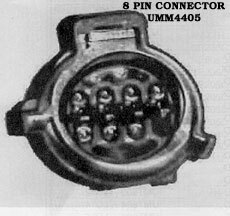 While this upgrade is not for everyone we can provide a custom built NP242 Select-trac replacement unit for the more aggressive driver. The NP242 has 2 high, 4 high part-time, 4 high full time and 4 low. Your cost on this conversion is $1175.00 plus $250.00 core deposit (refundable) plus the freight. Your 249J will be acceptable as a core. Encoder motor UMM1522 your cost $310.00 plus $35.00 core deposit. $ 40.00 Missing extension housing. Use the following figures to identify Yoke and Switch types. Transfer Case Assemblies are delivered with 12 month unlimited mile warranty, from time of purchase. When ordering please provide vehicle make, year, model,, transfer case model number and assembly numbers off existing transfer case tag, this information will ensure that you receive a direct drop in replacement. The core deposit will be refunded for assembled transfer case cores only. The core charge is a deposit placed on you credit card to ensure that you return your original transfer case, when received we send you a check the core deposit amount less return freight if returned COD (please call to make this arrangement). Prices subject to change without notice. Extended warranty is available to be purchased at time of original purchase. Warranty covers material and workmanship including parts and labor at the factory. The warranty will not apply to units damaged, broken cases, units run low or without fluid and damage caused by accident. This warranty is applicable to units returned to the factory for inspection and repair. This warranty does not cover freight or labor to remove or replace the transfer case.